Common Name: Stemona root, sessile stemona root, Japanese stemona root. Part Used & Method for Pharmaceutical Preparations: The roots are dug in spring or autumn. After the fibrous roots have been removed, the roots are cleaned and put into boiling water. Then they are dried in the sun and cut into pieces. Properties & Taste: Sweet, bitter and neutral. Functions: 1. To moisten the lungs and stop cough; 2. To kill lice and parasites. 1. Cough in common cold. Stemona root (Baibu) is used with Platycodon root (Jiegeng), Schizonepeta (Jingjie) and Aster root (Ziwan). 2. Whooping cough. 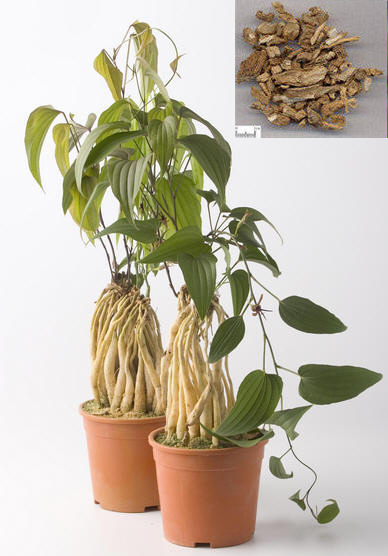 Stemona root (Baibu) is used with Glehnia root (Beishashen), Tendrilled fritillary bulb (Chuanbeimu) and Swallowwort rhizome (Baiqian). 3. Lice of the head or body. The herb is made into a 20% tincture, or a 50% decoction used as an external wash.
4. Cough due to tuberculosis. Stemona root (Baibu) is used with Ophiopogon root (Maidong) and Fresh rehmannia root (Shengdihuang). 5. Pinworm. The 30-ml 100% decoction as an enema before sleep, daily for five days.